The Deezer application was one of the first to bring music to our Chromecast. With Deezer, you have FREE music on your mobile, tablet and computer. Millions of songs are waiting. Also your favorite artists. Discover the music you like with custom recommendations from Deezer editors combined with a super algorithm that the application uses to calculate and show you songs or artists you may like but you don’t know yet about them. With Deezer in FREE mode you can: Listen Flow and discover new favorites. Enjoy all your mixes without limits. 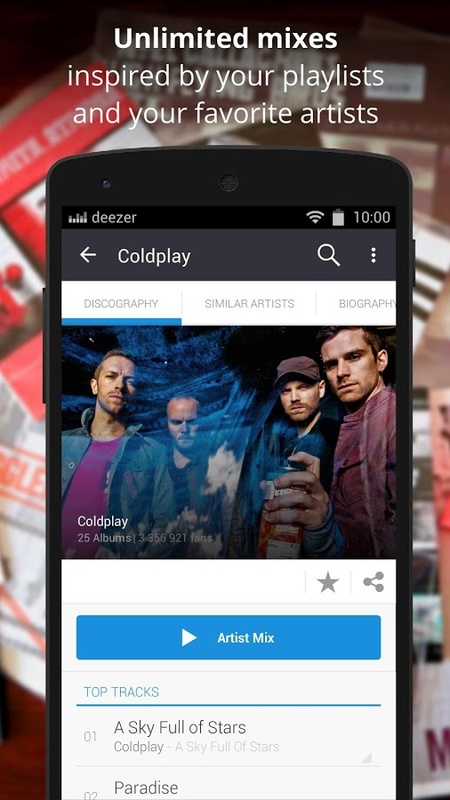 Deezer lists based on your tastes and create as many as you want. Get lyrics of your favorite songs. In addition Deezer has a mode Premium+ (you can try it for 15 days) and lets you listen to any music without commercials in between. The sound quality is improved. You have the option to sync songs to listen offline and into the “radio” mode you can skip as many songs as you like.